This time every fall our grocery stores and farmer markets are filling their shelves with apples of every kind and color. Green, yellow, red, red-yellow, green-red and the creamiest yellow I’ve ever seen. The aroma of the apple area always brings back fall kitchen memories for me. Both sets of my grandparents had some sort of apple tree in their yard. And our family didn’t believe in wasting anything so apple recipes were being exchanged among all the members of my family. Apple butter was one of the last foods to be made. You could use older apples, bruised apples and somewhat damaged apples and you still get a tasty apple butter. I never liked apple butter when I was a kid. But now, I love fresh apple butter. Add another food that I wouldn’t touch as a kid to one I enjoy as an adult. I think the first time I experienced apple butter that I actually liked was in Shipshewana, Indiana at Das Dutchman Essenhaus. It was fresh and the spicy fragrance made me want to try it. Surprise! I liked it. I don’t know what happened to my taste buds between 6 and 60, but something did. Don’t get confused between apple butter and apple sauce. Try putting apple sauce on your piece of warm crispy toast and see how soggy that gets in no time. There is a significant difference between the two. Apple butter is velvety and spreads as thick as jam over your toast. 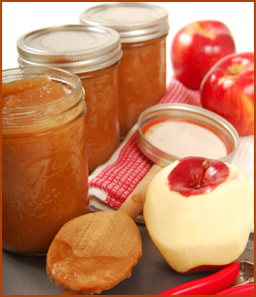 Apple butter is most enjoyable when it is full of spices and sweets and brings visions of autumn mornings to mind. Apple butter made by my “Ma” (my maternal Grandmother, Alice) usually took about a whole weekend to come from the tree to the table. Gosh, I wish now that I would have liked it. I still have wonderful memories of that week of preparing apple butter. As far as I am concerned, cozy childhood memories are always created in our kitchensl. I can come up with a memory for each season depending on the aroma of the food cooking. Traditionally, apple butter was prepared outdoors, in big kettles over an open fire. Now, that would create a memory. It took a whole community to finish it. In my childhood, however, we weren’t feeding the entire neighborhood. Ma made it in a big kettle in her kitchen (her tiny kitchen by today’s standards.) She filled the sink with water and added the apples, swishing them around each time she grabbed one. Don’t ask me, I’ve researched this and can find no reason why she would do that, other than she wanted to. Ma didn’t get to do a lot of things that she wanted to, so maybe this just made her happy! You go Girl Ma! Here is the recipe from “The Household Searchlight Recipe Book” page 100, circa 1931. I am pretty sure that this was Ma’s recipe. Add ½ much sugar as there is pulp. Simmer slowly, stirring constantly, until thick. That’s it! It seems that we always make our recipes so complicated and that we want to be told every step of the way what to do. 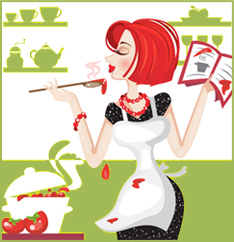 Do you think that this is why we are so intimated when it comes to cooking? Seriously, when I was looking up apple butter recipes on the internet, I found so many of them, and most of those I didn’t even understand. And when I get to that point with a recipe, I say, poo poo on it. I’m not doing it. I have to admit, that I did make changes to the second batch of apple butter. I added some Rum to the apples while they were cooking and I used boiled apple vinegar. By the way, where’s the BUTTER? Try this recipe! vegan pumpkin raisen cookies. Gluten free!